"You are who you are." 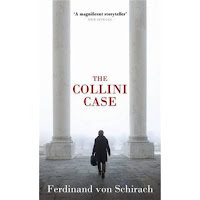 Actually, I had posted my discussion of this book at the crime segments part of my reading journal, but as it turns out, The Collini Case turned out to be less of a novel of crime fiction than I had expected, so I'm reposting it here. Obviously it doesn't fit the category of American novels, but it's very much worth mentioning. Much like Pia Juul's The Murder of Halland, The Collini Case is a novel based on the commission of a crime yet it really isn't crime fiction per se. There is a murder, but the focus of this novel is more on what lies beneath the decision of a retired Mercedes-Benz toolmaker to walk into a man's hotel room, shoot him, and then brutally kick him -- breaking all of the bones in his head while grinding his shoe into the man's face. While it's a novel, the book is really not meant to be entertaining; on the contrary, it is a story designed with a specific purpose in mind. If you're looking for the typical whodunit kind of read, pass on this one; it's not a staggering legal thriller, nor is it meant to be. In an interview at BBC Radio 4, Von Schirach notes that when he writes about crime, the whodunit is not important to him, but rather it is the motive behind criminal acts that he finds interesting. This is certainly the case in his novel, where Fabrizio Collini, a long-time worker at Mercedes Benz, makes an appointment with a wealthy industrialist at his hotel in Berlin. Posing as a journalist, Collini is welcomed into the man's room, where he promptly proceeds to put four bullets into the man's head, and repeatedly grind his shoe into the dead man's face. When the act is finished, he goes downstairs, asks the woman at the front desk to inform the police that the man in room 400 is dead, then quietly waits to be arrested. It isn't long before he is taken into custody, but when his lawyer, Caspar Leinen, arrives, Collini provides only minimal answers. Yet he will not answer the crucial question as to why he killed the man. Leinen, a new defense attorney, knows he's going to have his work cut out for him; but little does he understand the ramifications of taking on Collini's defense. The Collini Case is difficult to summarize without ruining it for prospective readers, but even in its spare, understated tone, this slow-paced story is powerful and gets to the thematic issue of guilt as determined by a person's circumstances. Also present throughout the story is the idea of justice in the present world where the past still has a strong foothold within a system that may have very well failed at its own mission. While these themes are writ large, there's also a side trip into the reflections of one's own life in the light of revelations of family secrets. You may think as you read that you know what's coming down the pike, but trust me, that's not really the case. Ferdinand von Schirach is himself a criminal attorney with a past not unlike that of some of the characters in The Collini Case. While some readers found it "predictable," "pedestrian," and found that the core issue may have been better served in a pamphlet or magazine article, I have to disagree. It is an all-too human story about the consequences that evolve out of fundamental wrongs within the system that somehow everyone overlooked, with devastating results all around. I think people started into the book with expectations of a legal thriller and the fact that it came out to be something entirely different may have proved disappointing, but that's certainly not the fault of the author. While true blue mystery/crime fiction fans may not find what they're looking for in this book, to me it was an eye-opening story with a punch. Perhaps a crime-fiction audience isn't the best market for this novel, but it's quite an engaging read that I finished in one sitting. Now I'm going to pull out my copies of his other books Crime and Guilt which have been collecting dust on my shelves; I can't wait to read what else this man has written. Definitely recommended.